Here we have the Universal greenhouse range which comes in two different sizes these are ideal for all real enthusiasts. The Universal has been made with unique features that some of the other greenhouses don't come with. It will come with a box section ridge which gives the greenhouse a classic look. Like most of the Halls Greenhouses the Universal too comes with cast joints at both the ridge and eaves giving the greenhouse sound investment for your long term gardening needs. Each Universal greenhouse comes with two roof vents and a single sliding door. The Universal in two sizes will also come with integral guttering with all of them. 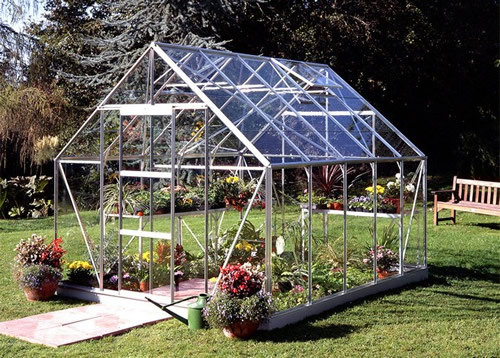 You will also need to make sure that there is a firm level area to place your Universal greenhouse, we can offer a steel base to go with your greenhouse. There are two glazing options available; 3mm standard horticultural glass or you can pay extra to have toughened glass which will be 3mm thick. The greenhouse will come with an easy clip glazing system whether you purchase the horticultural glass or toughened glass. Additional Accessories such as staging, shelving, rain kits etc. can be found in the the Halls Greenhouse Accessories Section on our website, or contact us for one to one advice. Here we have the Universal Greenhouse complete with integral guttering and silver finish, this classic greenhouse measures 3.22m deep x 2.57m wide.